For the ice hockey player, see Al Murray (ice hockey). Alastair James Hay Murray (born 10 May 1968) is an English comedian, actor and writer. Murray's career began working with Harry Hill at BBC Radio 4. He received acclaim at the Edinburgh Fringe Festival, before launching his "Pub Landlord" persona (which he describes as a "know-all know-nothing blowhard who knows the answer to every question even though he hasn't been asked any of them"). This in turn led to the 2000 Sky One sitcom Time Gentlemen Please. Oxford-educated, Murray's comedy is often hard-edged social and political satire. He continues to perform as a stand-up, and is a regular on British TV and radio. Murray was born in Buckinghamshire, where his father worked at British Rail. His paternal grandfather was the diplomat Ralph Murray, while his maternal grandfather was killed at the Battle of Dunkirk, and Al retains a deep interest in the history of the Second World War. He is a descendant of William Makepeace Thackeray, from whom he believes he gets his sense of satire. In 2003 he was listed in The Observer as one of the 50 funniest acts in British comedy and in 2007 was voted the 16th greatest stand-up comic on Channel 4's 100 Greatest Stand-Ups. Murray was born in Stewkley, Buckinghamshire, the only son of a Lieutenant Colonel in the British army. A descendant of the novelist William Makepeace Thackeray, his grandfather was the former British ambassador Sir Ralph Murray, was from Scottish aristocracy and married into the Kuenberg family, Imperial Counts of the Holy Roman Empire. His patrilineal great-great-grandfather, Dr George Murray, was Bishop of Rochester, while Sir Edward Leigh MP is his third cousin. Al Murray is in remainder both to English and Scottish peerage titles, including the barony of Strange and the dukedom of Atholl. Murray was educated at Bedford School, and St Edmund Hall, Oxford, where he read Modern History. He later said of his time at school: "When I was nine I was sent to boarding school, which I despised. The first five years were hideous because I wanted to be at home. I guess I resented my parents a little and it put tons of distance between us. One of the things I took from boarding school is that it made me emotionally self-sufficient." At Oxford he performed in the comedy group the Oxford Revue, in a show directed by Stewart Lee, later an Honorary Fellow of St Edmund Hall. Murray married Amber Hargreaves in 2002. The couple, who have two daughters, Scarlett and Willow, separated in 2008. Murray is a keen cricket fan, and was invited to attend a farewell lunch for the England cricket team before their departure for the 2013–14 Ashes series. Murray, together with Stephen Fry, supported Paul Chambers' High Court appeals after Chambers had been arrested for contravening the Communications Act 2003 when a joke tweet was regarded by police as "menacing" and a terrorist threat. An appeal against Chambers' conviction was successful. In August 2014, Murray was one of 200 public figures who were signatories to a letter to The Guardian expressing their hope that Scotland would vote to remain part of the United Kingdom in September's referendum on that issue. Murray was awarded an honorary degree (Hon MA) by the University of Bedfordshire in 2014, and an honorary Doctor of Social Science (PhD) by the University of Wolverhampton in 2017. Having started out by touring with comedians such as Harry Hill and Frank Skinner, Murray won the Perrier Award at the Edinburgh Festival Fringe in 1999, after being nominated in 1996, 1997 and 1998. He started out with an act that involved sound-effect impressions, including guns, animals and a car boot. With this act, he supported Jim Tavaré in Leeds in Winter 1992. In 1994–95, he was the drummer in the band Evangelista, the house band at Stewart Lee's and Simon Munnery's experimental Cluub Zarathustra in London. Film maker Martin Pickles made a short film about the band in 2002. At this time the lead singer Reid described Murray as "he's still not a household name, but anyone who's into comedy knows who Al Murray is". Murray's character is an English publican with conservative values and an animosity towards Germans and the French; challenges audience members to name any country before producing some plausible instance of Britain bettering it. The character has great love for the British 1970s rock band Queen, often getting musician(s) on his show to perform one of Queen's tunes in their own style. The character first appeared in 1994 during the Edinburgh Festival Fringe, in the show "Pub Internationale", with Harry Hill and Matthew Bradstock-Smith (who played "Little Alan" as well as the keyboards in Hill's Edinburgh, radio and TV shows). The show featured the "Pub Band", with Murray playing the drums and compering. After trying out a character deemed not to have worked, at the opening show Murray suggested saying that the compere had not made it to the show and that the barman in the venue, the Pleasance Cabaret Bar, had offered to fill in. At the Edinburgh Festival, Murray came up with "The Pub Landlord". Murray made his first television appearances on Harry Hill in 1997 playing Harry's big brother Alan ("If it's too hard, I can't understand it! "), and subsequently featured in a short film, Pub Fiction. He made a brief appearance as the Pub Landlord in Series 2, Episode 6 of Lee and Herring's This Morning with Richard Not Judy. Murray's Pub Landlord theatre show, My Gaff, My Rules was short-listed for an Olivier Award in 2002. The Pub Landlord is the central focus of the television series Time Gentlemen Please, as well as a number of other television appearances, including the An Audience with... strand. Subsequent theatre tours were: ...And A Glass of White Wine for the Lady (another catchphrase) and Giving it Both Barrels. The Pub Landlord has hosted several television programmes including Fact Hunt, named after the fictional quiz machine of the same name from Time Gentlemen Please. In addition, the character has ghost written four books: The Pub Landlord's Book Of British Common Sense, The Pub Landlord's Think Yourself British, The Pub Landlord's Great British Quiz Book and Let's Re-Great Britain. As a teenager, Murray was a drummer in the "big band" at Bedford School, and also played percussion in the Bedfordshire County Youth Orchestra. He played drums on the music for "The Pub Landlord" television series and during an appearance on "Happy Hour" by Phil Collins they performed a duet. He also plays the drums for the rock cover band T-34 and appeared at the Download Festival in 2010, returning once again in 2011. Murray presented Al Murray's Road to Berlin on the Discovery Channel. This was a series about the last phase of the Second World War, taking him from the beaches of Normandy, through Arnhem and up the Rhine, ending in Berlin. In the series he drove around in a restored Willys Jeep, and interviewed survivors from both sides of the war. In the episode about Operation Market Garden he parachuted, together with veterans, from an aircraft, to commemorate the battle. Murray starred in Al Murray's Multiple Personality Disorder, a sketch show, which aired in early 2009. In late 2010, Murray made a documentary on German culture for BBC Four Al Murray's German Adventure in which he presented a different side of the German nation from the one portrayed by "The Pub Landlord" character. Murray invented his own potato crisps – branded "Steak and Al Pie" – as entered in a "crisp competition" hosted by Gary Lineker, used to raise money for Comic Relief. The other flavours were "Jimmy Con Carne" (Jimmy Carr), "Stephen Fry-Up" (Stephen Fry) and "Frank Roast Dinner" (Frank Skinner). The winner was Stephen Fry-up at 27%, with Al's in 2nd with 25%. The other two got 24% each. In September 2015 Murray co-founded the British Drum Company. In August 2016 and March 2017 Murray sat in for Steve Wright on his Steve Wright in the Afternoon show on BBC Radio 2. In April 2016, Murray played Nick Bottom in Shakespeare Live, a celebration of 400 years of Shakespeare, opposite Judi Dench as Titania. In 2018 he starred in pantomime at the New Wimbledon Theatre, as Jack's brother Al, in Jack and the Beanstalk, winning 'Best Newcomer' for this role, at the Great British Pantomime Awards in April 2018. In October 2018 Murray fronted the HISTORY TV series Al Murray: Why Does Everyone Hate The English, appearing as both Al Murray and his alter-ego The Pub Landlord. The series looks at the historical rivalries between England and its closest neighbours and features comedians Antoine de Caunes, Elis James, Andrew Maxwell, Fred MacAulay and Henning Wehn representing their respective nations. In 2003 he was listed in The Observer as one of the 50 funniest acts in British comedy. In 2007, he was voted the 16th greatest stand-up comic on Channel 4's 100 Greatest Stand-Ups. Farage appeared to welcome his new opponent on Twitter, saying "the more, the merrier", and a spokesperson for the UKIP MEP said: “at last, serious competition in the constituency”. The Conservative candidate, Craig Mackinlay, said he enjoyed Murray's video and his proclamations but was not worried that the comedian would split the anti-UKIP vote. Finally, the Labour candidate, Will Scobie, insisted it was "always good to have people putting their names forward to stand" and that Murray would "certainly make things interesting". When nominations for South Thanet were released on 9 April 2015, it was confirmed that Murray would appear on the ballot paper with no description, rather than his FUKP name and emblem. The results of the election were announced on 8 May, revealing that Murray garnered 318 votes. This number of votes was higher than the average votes received by candidates from, amongst others, the Communist, Socialist and BNP parties. [not in citation given] When it was announced that Farage had failed to get elected, coming second in the poll to the Conservative candidate Craig Mackinlay, Murray's reaction – feigning shock and clapping on stage – garnered widespread media attention. Speaking to the media during the vote count, Murray invited Farage to a drink in his pub to drown his sorrow at losing. ^ Cavendish, Dominic (3 March 2007). "Prime time gentlemen, please". The Daily Telegraph. London. Retrieved 23 April 2010. ^ "Al Murray's Biography". Chortle. Archived from the original on 7 January 2007. Retrieved 27 December 2006. ^ "Mauricette Vladimira Marie Reichsgräfin Kuenburg". The Peerage.com. Retrieved 15 August 2013. ^ "Debrett's Peerage & Baronetage". 2015. Archived from the original on 13 November 2015. ^ "Comedy Writers". St Edmund Hall. Archived from the original on 14 July 2018. Retrieved 20 January 2015. ^ a b "Al Murray". BBC Comedy. BBC. Retrieved 27 December 2006. ^ Irvine, Chris (10 October 2008). "Al Murray breaks up with wife". The Daily Telegraph. Retrieved 15 August 2013. ^ "Long Room goodbye for England's Ashes squad". Lords.org. 24 October 2013. Retrieved 26 August 2014. ^ "Robin Hood Airport tweet bomb joke man wins case". BBC News Online. 27 July 2012. Retrieved 9 September 2012. ^ "Honorand Al Murray praises University of Bedfordshire diversity". University of Bedfordshire. 21 November 2014. ^ "Honour for comedian Al Murray". University of wolverhampton. 22 September 2017. ^ "Perrier Comedy Awards". Archived from the original on 11 July 2007. Retrieved 27 December 2006. ^ a b Evangelista were Pat Reid (vocals), Martin Ellis (guitar), Paul Ewart (bass) and Al Murray (drums). Reid and Ellis were at school together in Crosby, Liverpool. Reid was at Oxford with Murray. The line up included different bass players of which Paul Ewart was the longest lasting. ^ Fall Apart: The Evangelista Story (2002), at 1.40. http://www.gmfilm.co.uk/fall_apart.html[permanent dead link] This comment lead to great audience amusement when the film was screened at Pickles' 45th birthday in London in 2013. Half of the band can be seen in a video by Pickles: https://vimeo.com/77492045 Pickles also produced an Evangelista CD in 2003 featuring Murray. Contrary to the film the press release claimed the band was active 1992-1995. ^ "Al Murray - The Pub Landlord's Summer Saloon". edinburghfestival.list.co.uk. ^ Stewart Lee discusses whether all of Murray's audience realise the character is satirical in his book How I Escaped My Certain Fate. London: Faber & Faber. 2010. pp. 293–294. Archived from the original on 29 October 2013. ^ "2001-2002 26th Laurence Olivier Awards". Los Angeles Times. Archived from the original on 17 October 2006. Retrieved 27 December 2006. ^ "Pints mean prizes". Chortle. Retrieved 12 February 2007. ^ Potter, Laura (28 October 2007). "What would you save if your house was burning down?". The Guardian. ^ "County Youth Orchestra". Friends of Bedfordshire Youth Music. ^ "Download Festival - T34". Archived from the original on 19 January 2011. Retrieved 8 January 2011. ^ "Landlord pulls in stars". Manchester Evening News. Archived from the original on 25 January 2007. Retrieved 12 February 2007. ^ "Putting the Al in altitude". Chortle. Retrieved 12 February 2007. ^ "Al Murray: His Gaff, His Rules". Chester Chronicle. Retrieved 26 December 2008. ^ "Al Murray's German Adventure". BBC Four. 10 April 2011. Retrieved 15 August 2013. ^ Thompson, Jody (7 February 2011). "Do they taste funny? Jimmy Carr and Al Murray in crisp flavour battle for Comic Relief - with help from Gary Lineker". The Daily Mail. ^ "Stephen Fry Up wins Walkers Clash of the Comics for Red Nose Day". Talking Retail. 18 March 2011. Retrieved 15 August 2013. ^ "About British Drum Co". British Drum Co. 6 January 2017. ^ "Dame Judi leads Shakespeare Day gala finale". BBC News Online. 24 April 2016. ^ "Pantomime Awards website". 18 October 2018. ^ "A+E Networks' History Asks 'Why Does Everyone Hate The English?' With Comedian Al Murray – Edinburgh". Deadline Hollywood. 22 August 2018. ^ "The A-Z of laughter". The Guardian. London: Guardian Unlimited. 7 December 2003. Retrieved 27 December 2006. ^ Rose, James (3 February 2015). "Pub Landlord Al Murray visits Thanet as FUKP leader". Kent Online. ^ Singh, Rajnish (22 January 2015). "Al Murray's eurozone crisis solution: 'Europe goes on the pound'". The Parliament Magazine. ^ a b "Al Murray to stand against UKIP's Nigel Farage". BBC News Online. 14 January 2015. Retrieved 14 January 2015. ^ almurray (14 January 2015). "The Guv's common sense message to the UK". YouTube. ^ McTague, Tom (14 January 2015). "Pints for a penny and some Poles to brick up the Chunnel: Pub Landlord Al Murray sets out his FUKP pitch for Parliament... standing AGAINST Nigel Farage in Thanet". MailOnline. ^ a b Perraudin, Frances (14 January 2015). "Last orders for Nigel Farage? Pub Landlord takes on Ukip". The Guardian. Retrieved 14 January 2015. ^ "Watch: Al Murray Pub Landlord to take on Nigel Farage". The Daily Telegraph. 14 January 2015. Retrieved 14 January 2015. ^ "Al Murray Pub Landlord To Run Against Farage". Sky News. 14 January 2015. ^ Steerpike (15 January 2015). "Al Murray in Twitter spat with Ukip MEP". The Spectator. ^ "Election of a Member of Parliament: South Thanet Constituency". Thanet District Council. Archived from the original on 7 May 2015. Retrieved 26 April 2015. ^ Nianias, Helen (9 April 2015). "Pub Landlord Al Murray uses fire engine to launch FUKP election campaign for South Thanet". The Independent. ^ Bailes, Kathy (9 April 2015). "An A to Z of the elections in Thanet". Isle of Thanet Gazette. Archived from the original on 3 July 2015. ^ Nianias, Helen (8 May 2015). "It's not just Nigel Farage: Al Murray the Pub Landlord loses South Thanet bid despite patriotic pledges". The Independent. Retrieved 11 June 2015. ^ Connor, Laura (8 May 2015). "Watch Al Murray's priceless reaction as UKIP leader Nigel Farage is beaten by Tories in his target seat". Daily Record. Retrieved 11 May 2015. ^ "Nigel Farage can drown his sorrows in my pub should he lose, says Al Murray - video". The Guardian. ITN. 8 May 2015. Retrieved 11 May 2015. ^ "Al Murray to publish a political tract". Chortle. 5 March 2015. Retrieved 15 April 2015. 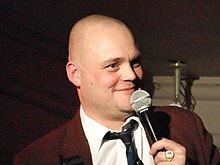 Wikimedia Commons has media related to Al Murray.